Cardiff City have revealed they have offered creditors Langston three options to pay the debt the club owes. The options are £8m to be paid now; £10m with £3m paid now and the rest in May, or £13m with £8m this year and an additional £5m if Cardiff are promoted. But sources close to Langston say those offers are unacceptable. Chief executive Alan Whiteley said that Langston's spokesman Sam Hammam, the ex-Cardiff owner, would be welcome to a life presidency at the Welsh club. Controversial businessman Hammam brought an end to his six-year tenure as Cardiff City chairman in October 2006 after agreeing to sell his majority shareholding, with former Leeds United chief Peter Ridsdale taking over the role at the south Wales club. Since then, Ridsdale has also left Cardiff following investment from the current Malaysian-based owners in 2010. The debt to the Langston company, taken out in 2004, is believed to be in the region of £15m. Whiteley revealed the details during a meeting with supporters, who have asked for their season tickets to be refunded because of their opposition to the club's rebranding. The club will change the kit from blue to red and introduce a new badge for next season as part of a "major and significant" investment pledge from Cardiff's Malaysian owners. The owners detailed a £100m investment pledge for squad strengthening, debt repayment and upgrading facilities earlier in the month. 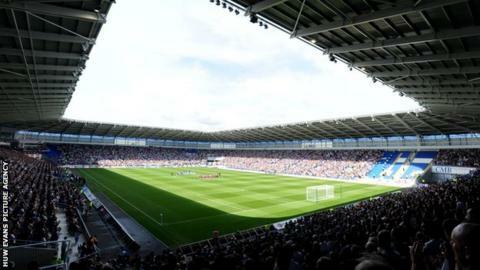 In a statement, current Cardiff City owner Tan Sri Vincent Tan said a further £35m would be pumped into the club over the next 12 months, taking the investment to £75.8m. It was also revealed around £10m was to be earmarked to settle the outstanding Langston debt.